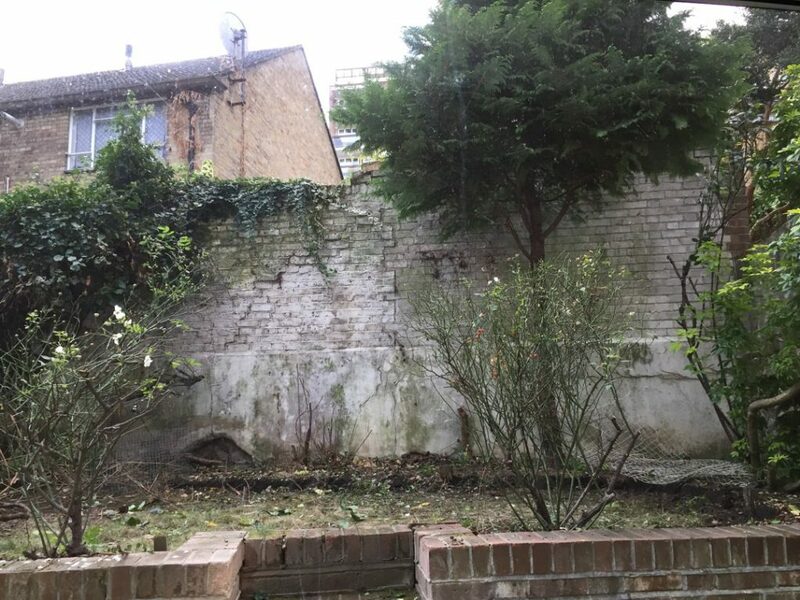 We live in Islington and have a small back garden that needed a serious overhaul after turning into a bit of a jungle over the years. The grass was struggling to grow and most of the ground was just mud. We specifically wanted a garden that would be low maintenance and require no lawn to mow. 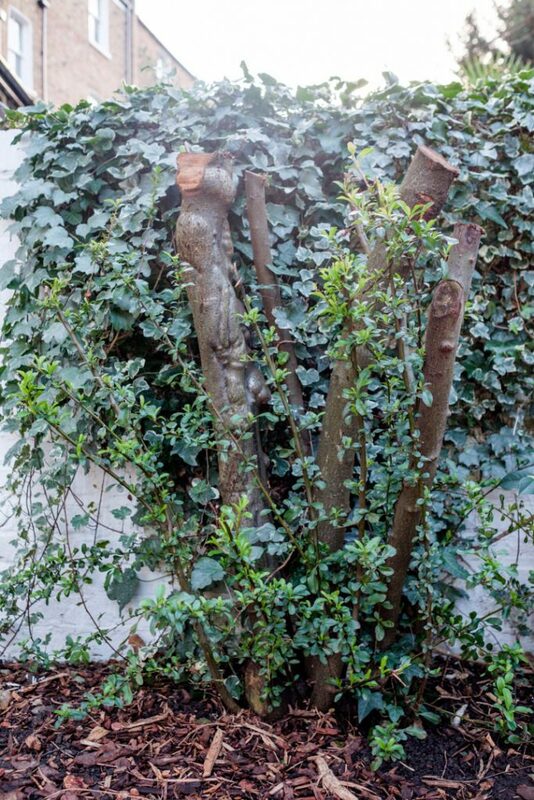 Most of all, it was important to me that our garden be eco-friendly as we really love nature and wanted our little urban space to a be celebration of it. 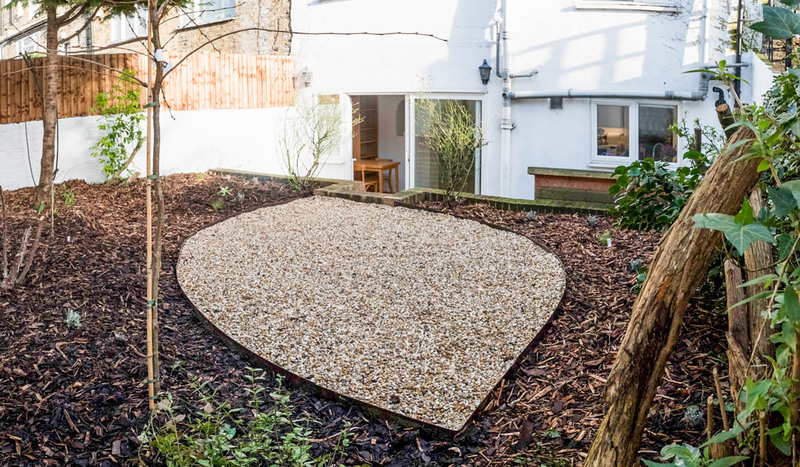 Personally I love lawn and had confidence that we could get our struggling lawn to thrive, but as we planned to rent our flat out we really needed this garden to be as simple as possible for tenants, while also being a beautiful space to enjoy in summer. I’ve always loved gardening but had never designed a garden before. My partner kindly gave me permission to design whatever I wanted (yes he was very brave!). Although he didn’t set a limit on our budget, the whole cost of the project came in at just under £1000. We are so thrilled with the final result and how relatively easy it was to do ourselves. 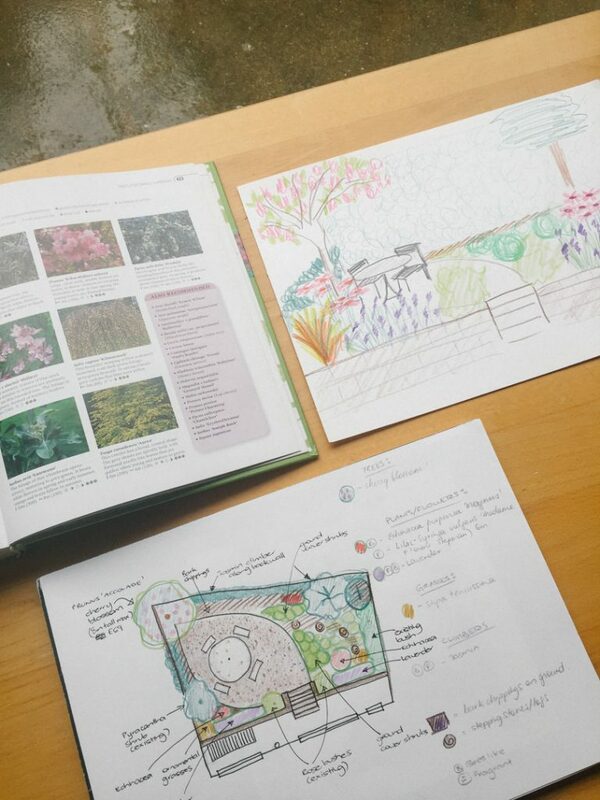 When doing my original research on urban eco-friendly gardens it was surprisingly hard to find any inspiration or advice for doing it yourself. I hope very much that this might inspire others like you to create your very own backyard oasis, and maybe help reconnect you with nature. It truly makes you feel like home. The garden just as planning began. 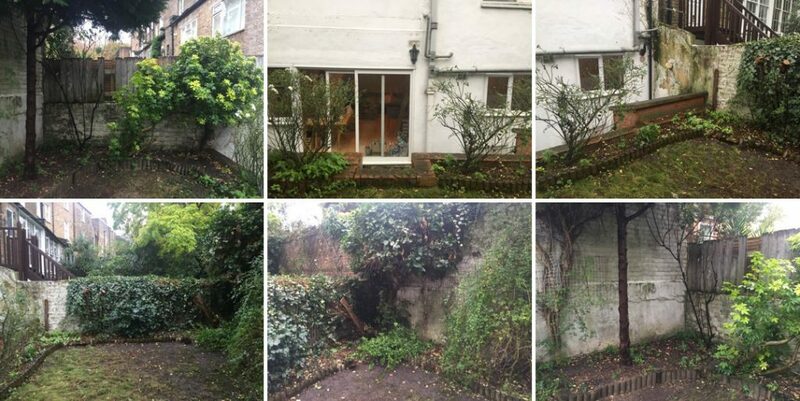 It was already trimmed back quite heavily, exposing walls & fencing that were in need of repair. The lawn was simply mud. First day at work clearing up the garden. In coming up with the design I had to consider the irregular shape of the garden. None of the walls are perpendicular to each other so I felt that if we were going to create a space like a patio for entertaining, it would look best if it was an organic, flowing shape to complement the harsh angles and lines of the various walls. We just needed enough space to fit a table and 4 chairs in case of entertaining friends in summer. I designed a teardrop shape for the entertainment area, which I felt was a natural evolution away from a traditional square or circle shape for a patio. 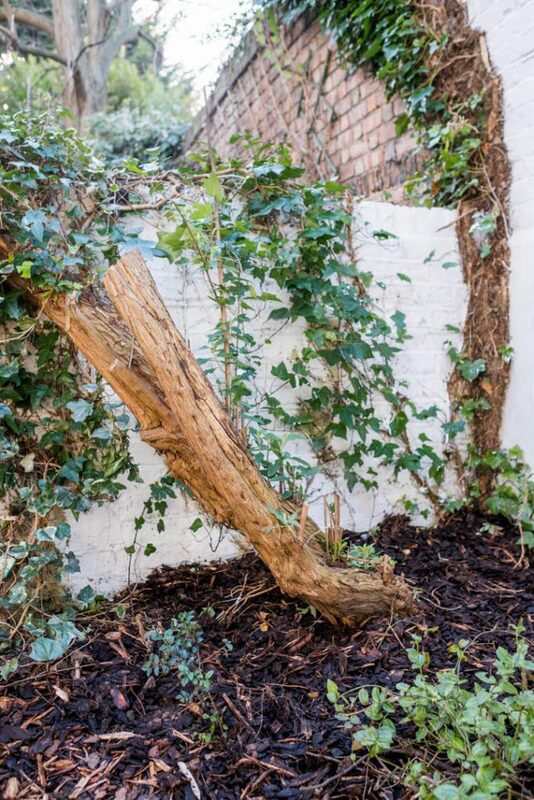 It also adds a bit of a contemporary feel to the otherwise natural garden. We have several different species of animals who enjoy our garden every day. Their visits have become something we cherish, and we were mindful that they need space too. Having peeked over our fences we could see that most of our neighbours had paved over their gardens leaving little space for our animal friends. The birds, bees & butterflies desperately need more trees & flowers. Paving & Astroturf were out of the question as they are ecologically damaging. They prevent water draining into the soil. This causes problems with London’s water table, which basically means it contributes to flooding in the city. There is so little green space in our cities as it is. I personally do not understand why we would want to suffocate the earth with concrete anyway. Timber decking looks beautiful for about a year but is actually high maintenance as it is exposed to weather and deteriorates over time. It’s also not great for the squirrels either who are not able to hide their food for the winter. I lived in a house previously where decking had been freshly installed, but within 3 years it all had to be ripped out because it had rotted completely. 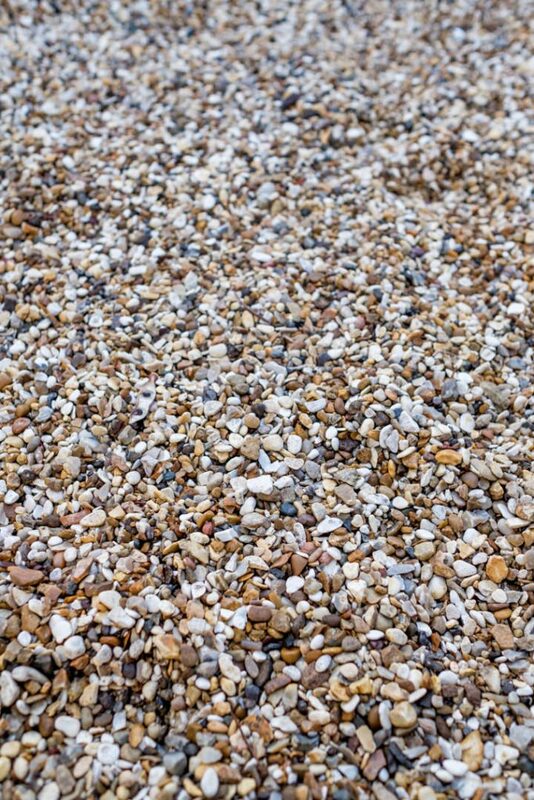 I chose gravel/pebbles because it allows water to drain while giving us a clear space to use. Although it was the most difficult thing to plan, it was all surprisingly easy to install. I wanted the pebbles to be natural colours and small so that if leaves and other garden debris fall on it, it won’t look very messy. There are some fashionable, contemporary pebbles that are so clean and big, but look messy once some leaves fall on them. To keep the gravel in the place, I needed borders so I ordered flexible steel edging from EverEdge and gravel mats from Homebase which I then cut to shape. The EverEdge borders are so easy to install, all I needed was a mallet and a block of wood to bang into place. I put weed fabric under the borders and gravel to help prevent weeds growing through, but this is the only part of the garden that we applied weed fabric to. 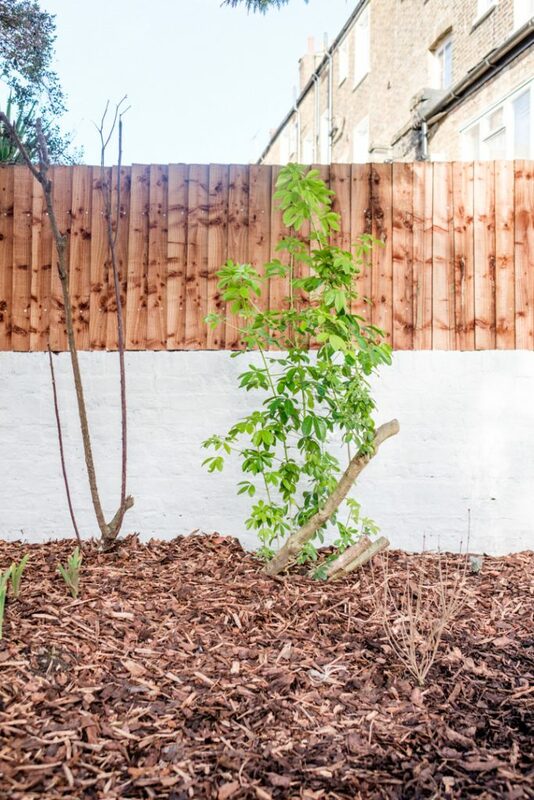 650kg / 35 bags of gravel and 1000L of bark chip put the final touches on the garden. 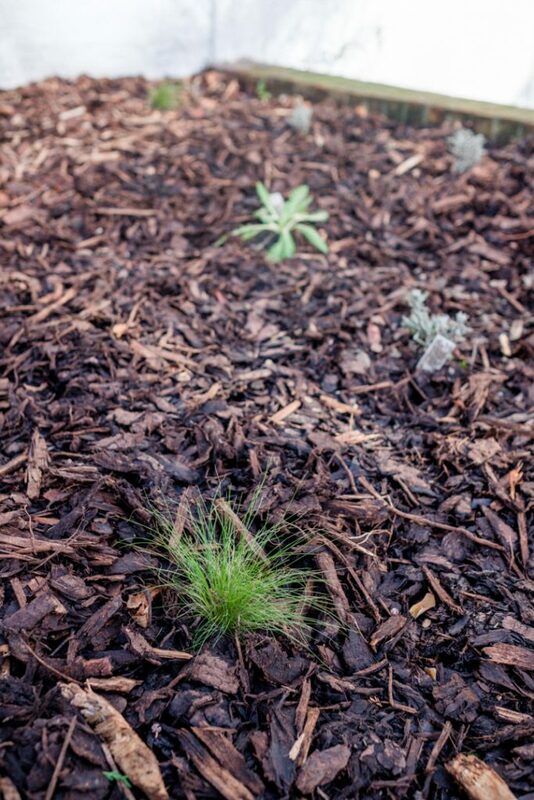 For the rest of the garden, I chose bark for the ground cover as it is aesthetically pleasing and also helps protect the plants. 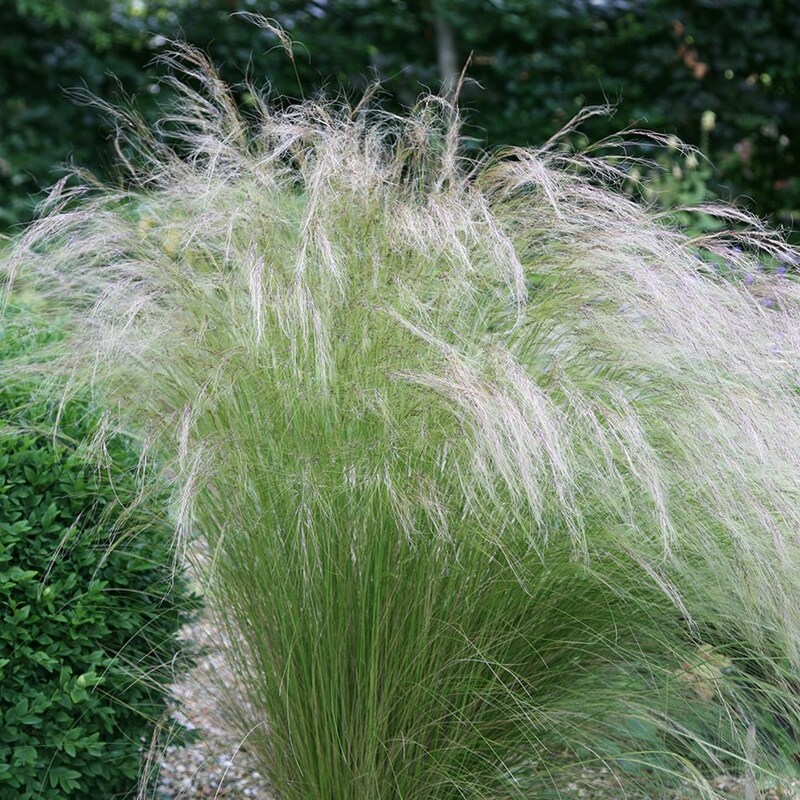 It will decompose and can easily be topped up or simply just blend in with the garden plants. I did not put weed fabric down under the bark because we wanted the squirrels to be able to continue to bury their nuts somewhere. Weed fabric is really just a short term solution, eventually weeds will grow above the fabric amongst the composting material anyway. We have no objections to weeds! People have such strong negative feelings about weeds and I’m not entirely sure why. In our case, we were not trying to create a manicured, pristine garden. The whole point is for our garden to thrive as it would naturally with minimal human interference. Less work for us and a better balance for nature. We looked at what plants we already had. 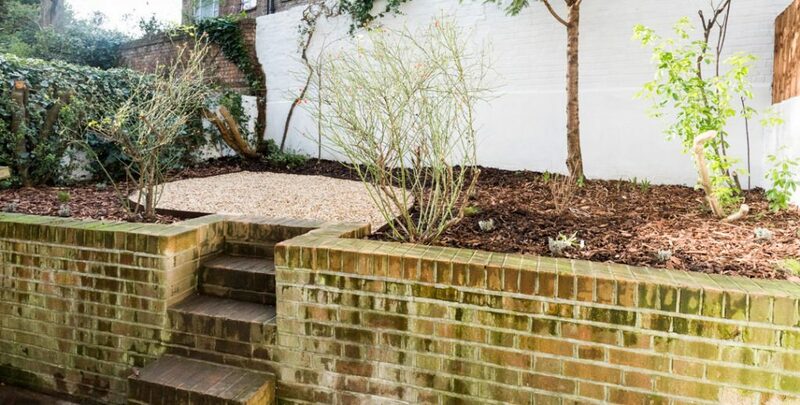 Most of the bushes that had originally been planted years ago had completely overgrown so we decided to trim them back completely to open up the space and create more light in the garden. 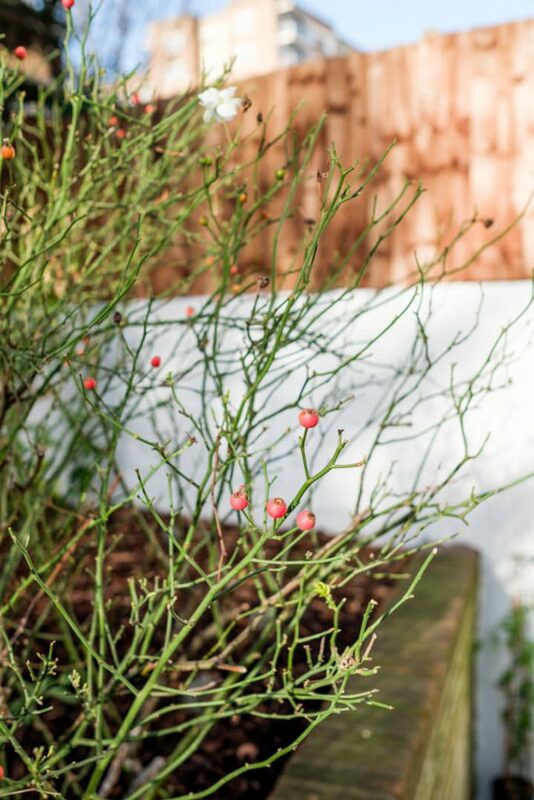 We wanted to avoid removing plants because it felt best to honour the ones that have thrived there for so long, especially as we knew the wildlife love them. As we were surrendering much of the failed lawn area back to the garden, I had room to plant more things. I was looking for plants that would not grow very tall and if left without trimming, would look lovely. 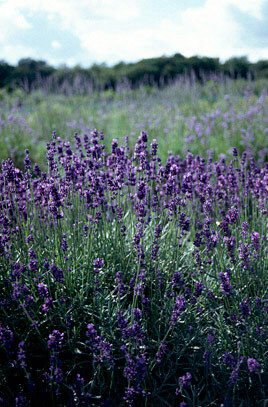 I wanted them to be good for birds, bees and butterflies. 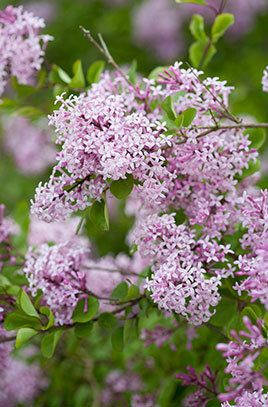 I also wanted splashes of colour and fragrance which is a given when choosing bee/bird friendly plants anyway. When planting them all I was careful to leave lots of space between everything. 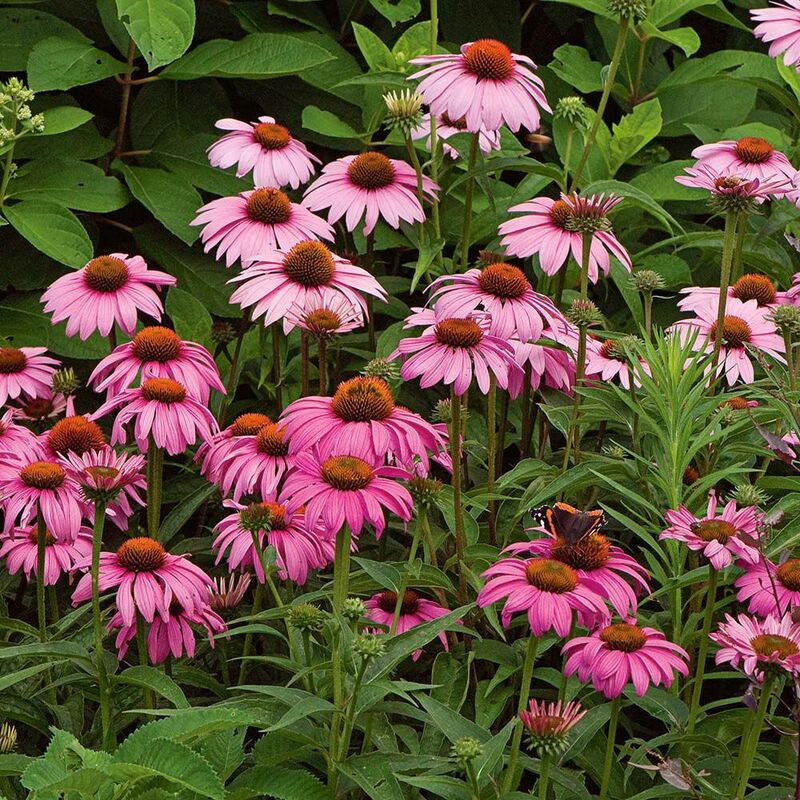 When plants are still so tiny, it’s too easy to make the mistake of planting things too close together which leads to overcrowding. 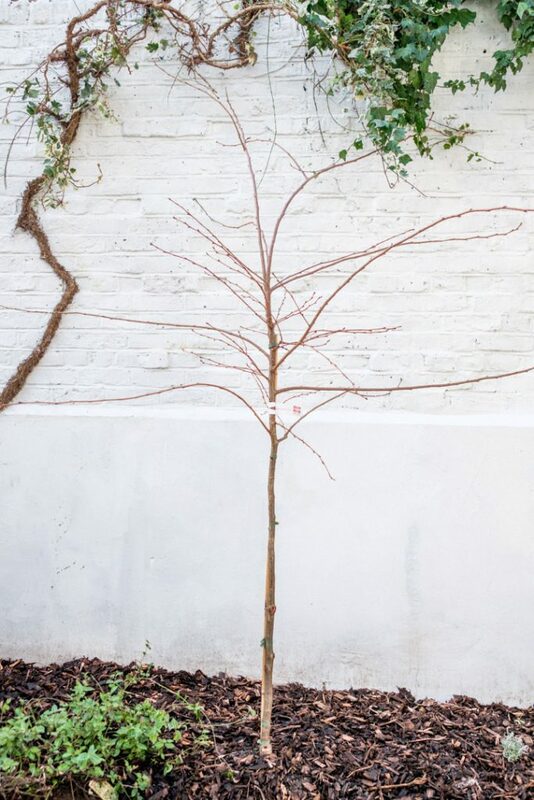 Right now it might look minimalist, but in a couple of years it will be thriving and very green. We finished the garden in winter 2018 and it’s going to take at least a year to see it flourish in it’s full colour and glory, but already it has made a huge impact. We had the walls & fences repaired and painted which really made the space regain it’s vibrance. The finished result. Completed in December 2018. Next summer will see the garden come to life with bushes and flowers. We had to trim back the Buddleia but it’s a butterfly magnet so we definitely wanted to keep it. This Pyracantha was at least 5 metres tall, covered the entire garden and had to be trimmed back quite extensively. It’s already growing back and we will keep it as a bush. The birds love this tree for the tiny fruits it has in summer. Existing rose bush with fruits that the robins love. Stylish Stone Golden Gravel from Homebase. The orange blossom tree and rose bush had both grown over the fence into the neighbouring garden and needed to be trimmed back. 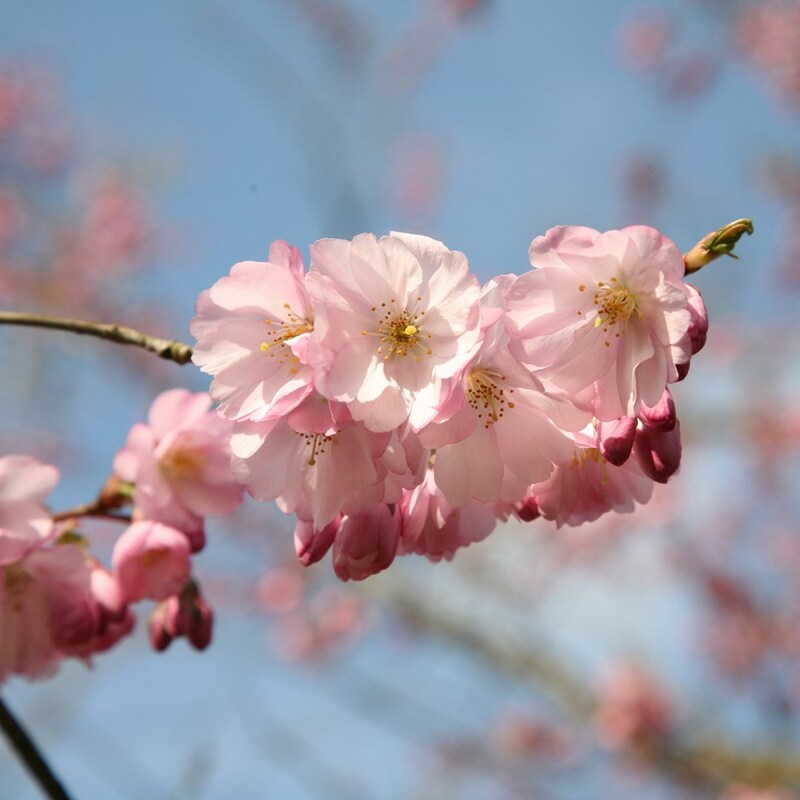 A new addition: A cherry blossom tree that will fill the garden with colour. Natural grasses, lavender & echinacea intermixed throughout the garden. The bark chip looks great. 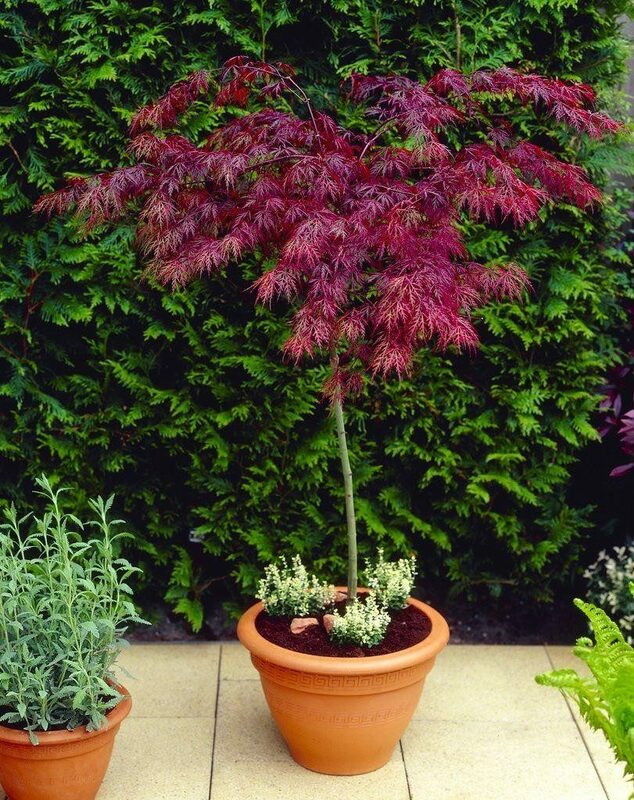 Do you have an eco-friendly garden? I’d love to see what you’ve done. Or feel free to ask me questions about what we did, I’d love to help inspire others to create your own eco-friendly space.